Perfect For: Brunch Day Drinking Sports! Boulton & Watt is a solid neighborhood hang. It’s more of a bar with food than it is a restaurant, but the expansive menu, including weekend brunch, makes it worthy of a full review. This place is tailor made for the mid-20′s crowd that now lives on the LES and populates B&W on the regular. You know, the ones that move down here once they’ve realized they’re still single and too old for Murray Hill. 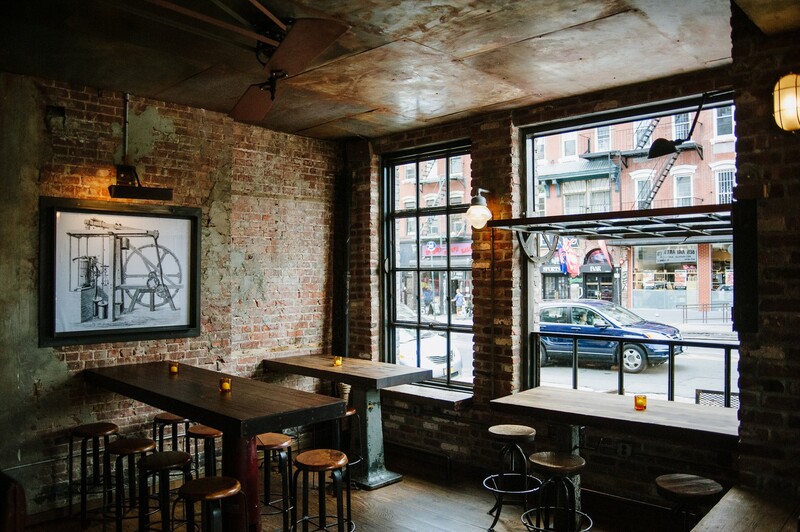 It’s a useful spot to hang with friends, get drunk and eat some above average bar food. The menu has some surprises, and isn’t too typical. It’s all a little pricy for what it is, which certainly affects the rating here. None of the plates are exactly photo worthy, but much of the food tastes a lot better than it looks. As we are all aware, there are not a lot of great places to eat AND watch a game. What’s most impressive about Boulton & Watt and what makes it super useful is its ability to be a sports bar when it wants to be. They camouflage a bunch of flat screens all around the room, which are usually off and not an eyesore. Tasteful TV placement is a tough line to toe, yet they do it well here. Our first time through, we were pissed because we were under the impression there were no TV’s, and thinking this would be the perfect local spot to watch games. Our bad. If you’re just looking for a place with Sports On TV, raise this rating 1.5 points please. See you Sunday. You know the artisan ways of pickling have reached the over-saturation point when the local gastropub with sleeper flat screens has an entire menu section dedicated to it. You can choose from Pineapple with Habanero to Watermelon with Rosemary and Ginger to Cherry Peppers to more traditional Cucumbers or Zucchini. The serving size, for $5 a pop, is a little small, and while we liked most of the ones we tried, we wouldn’t get overly excited about the pickle prospects here. Thick, buttery toast topped with layers of short rib and bone marrow? What’s not to love. This is a good app to share, as it’s super rich and you really only need a taste. Being healthy isn’t something they’re fond of here at B&W. ; They drench their green vegetable in egg, Parmesan cheese, bacon and caramelized onions. I guess you could get a salad if you wanted instead, but what’s the point of that? A nicely sized serving of Mac and Cheese with white cheddar and bread crumbs that isn’t overly memorable, but will get the job done. Definitely our favorite of everything we tried, these are a must order. Mini house made sausages in blankets served with a hot spicy mustard and curried ketchup. We housed these in five seconds. A solid burger on a toasty brioche bun with excellent fries, but an expensive burger as well. Once you get bacon, cheese and a fried egg on top, you’re looking at $19.50, which, come on, is a little pricy. Then again, this place on a whole is a couple dollars too expensive for what it is, but we’ll let it fly because the food is good and they’re paying cable bills. These were plugged hard by our server, and turned out just OK. $5 a taco too, so we’re tough to please when we get pricy. While we love a chipotle aioli, this taco was just completely drenched in sauce to the point where that’s all you could taste. Sorry tempura mahi mahi, you play second fiddle to mad sauce, pickled onions and other typical taco fills. We’d skip these next time. Our server led us in this direction, and it was a mistake on our part to listen. Why would we order the chicken at a gastropub that doesn’t necessarily have amazing chicken? Because it had bacon and roasted chicken jus. Our fault. We should have known better. This was fine, the chicken was nice and moist, but the plate looked like sh*t and it just wasn’t necessarily something we ever need to eat again. We had a couple bits and pushed it off to the side. Skip. The Folly is a nautical-themed bar in a basement on Houston with good Happy Hour deals. White Oak Tavern is an American spot close to NYU with a lot of seating and a big whiskey selection.